Bwin were the first online poker room to get the stamp of approval from Apple for a real money poker app. Since then they've merged with Party Poker to create the world's second largest online poker network. 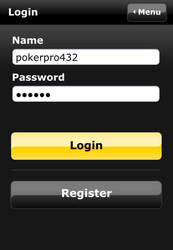 Bwin Mobile is available on iPhone, iPad and Android OS. Versions available for Android, iPhone and iPad. Huge players base following merger with Party Poker. Download the app and Get a $500 welcome bonus. One of the best looking and easiest to play poker apps. 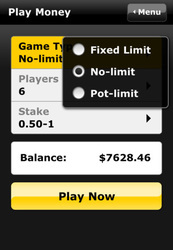 Bwin Mobile currently only supports Texas Hold'em. High Speed poker available on iOS. No tournaments. Bwin is one of the largest and most widely recognized companies in the entire online poker world, so it should come as no surprise that when iPhone poker apps became popular, the giant has decided to make a release. Thankfully, Bwin’s new iPhone poker client wasn't rushed and the quality of the final product easily holds up to the same, high standards that desktop players have been enjoying for years now despite a few minor hiccups. The app allows iPhone owners to compete against both PC and mobile users playing on the PartyPoker network, so finding a table shouldn’t be a problem regardless of the time and day. The first thing you’ll notice upon starting the new app will be a great looking lobby featuring Bwin’s traditional black, gold an white design. The available modes include Play for Real, Play for Fun and a neat little tutorial section, which will guide you through the basics of the app’s interface using a pre-recorded sample hand. The Play for Fun mode allows you to compete against real players from all over the world using play money, so you won’t be able to win or lose any cash here. Nevertheless, I’d recommend taking your first iPhone poker steps here, as even a seasoned desktop-based online poker veteran might need some time to get used to the new layout and the general flow of the game. The Play for Real mode allows you to get serious and face real opponents with real money being placed on the line. Unfortunately, the only poker variant available in both modes is Texas Hold’em cash games, but in the end that shouldn’t really bother most players as this mode of play allows you to join and leave the tables as you please and is generally considered to be well suited for mobile users. Thankfully, all the popular real money choices are there, so whether you like to play heads-up, short-handed or full-ring the Bwin iPhone app has you covered in no-limit, pot-limit and fixed-limit variants. The stake selection is also quite impressive, allowing both for recreational microstakes play and high-rolling action. Regrettably, much like many other downloadable poker apps, Bwin’s product doesn’t allow you to manually select your table – once you decide you’re ready to go, you’ll be automatically assigned to one of the tables fitting the parameters you provided. 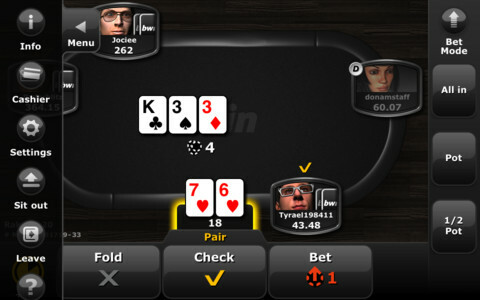 Just like its Android-based counterpart, the Bwin iPhone app goes a long way in terms of adapting the visuals of a desktop-based online poker client to a mobile platform. The card designs, the table and the buttons all look great and, more importantly, allow you to take control of the game despite the limited screen real estate. The only issue I’ve had with this app is the fact that the menu buttons and the slider used to adjust the size of your bet are a little bit too small and don’t feel very responsive, but aside from that everything is absolutely top notch in terms of functionality. 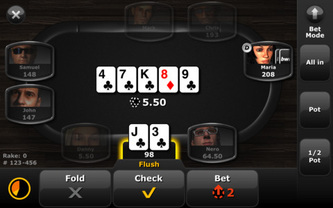 All the function buttons like bet, raise and call are large and easy to click, so it’s quite obvious that the developers of Bwin’s iPhone poker client were well aware of the limitations of a mobile device. 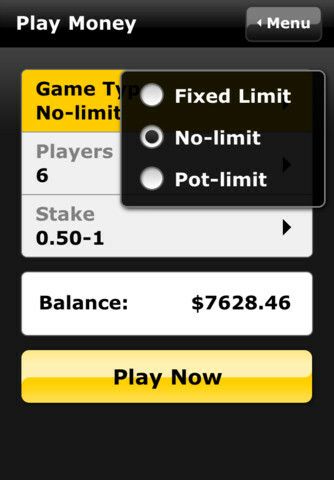 Unfortunately, like virtually all the other iPhone poker apps, Bwin’s software package doesn’t allow you to multi-table at all. Furthermore, the overall design and the fact that the app doesn’t allow you to select the tables you want to play suggest that implementing this kind of functionality would require a rather major redesign, which is highly unlikely if you consider how new this app actually is. The level of competition isn’t particularly high, so finding fish shouldn’t be much of an issue here. Nevertheless, it’s almost guaranteed that you’ll have to face a fair number of Bwin regulars – especially on the higher stake settings. Fortunately, whenever you feel like the table you’re playing on is becoming too tight, you can always simply disconnect and start another game a few minutes later – given the size of the player pool, it is highly unlikely the matchmaking system will place you at the table you decided to run away from. The first step on your journey to becoming a winning mobile player on Bwin’s network would be to grab the downloadable app from the iPhone App Store. Thankfully, the mobile version of Bwin’s poker site provides you with a quick download link, so the entire setup process is exceptionally fast and simple. 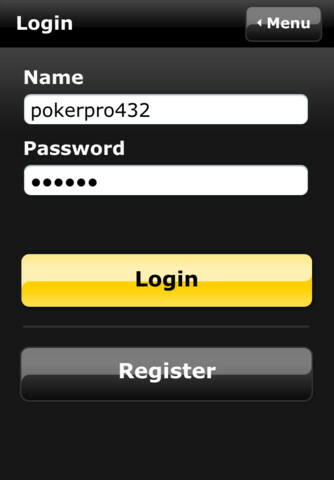 However, in order to use the app you’ll have to create a new Bwin account if you don’t already have one. Regrettably, the company doesn’t accept new customers from a number of countries due to legal reasons, so in the end if you’re a resident of one of the restricted regions you won’t be able to gain access to any of the games, which includes play money tables. On the brighter side, players allowed to play on Bwin will be able to grab some rather generous bonuses, including an extraordinary $500 welcome bonus which is a 100% match on your first deposit and which will definitely help you in building your bankroll regardless of your skill level or the amount of money you decide to invest. As you should know by now, Bwin’s iPhone poker app isn’t by any means perfect – but it’s worth pointing out that most of the flaws I’ve pointed out are shared by other mobile-based poker clients. To put it simply, the technology isn’t really there yet, so you won’t be getting your desktop-based poker client in a mobile package. Nevertheless, what you do get is an exceptionally well-designed app focused on a popular, entertaining and lucrative poker variant, a massive player pool which is rather soft for its size and amazing graphics that simply outclass browser-based apps. In the end, if you aren’t hell-bent on playing Sit and Go’s or Omaha on your iPhone poker app, Bwin’s software package is more than likely to keep you entertained for hours regardless of where you go. Reviews of other mobile poker rooms.